The Manchester Docks opened in 1894 and by the end of World War II were the third busiest docks in the UK. In the 1970s, unable to accommodate larger container vessels, they fell into decline and closed in 1982. Shortly after their closure, Salford City Council launched a massive scheme to regenerate Salford Docks; the western section of the port. 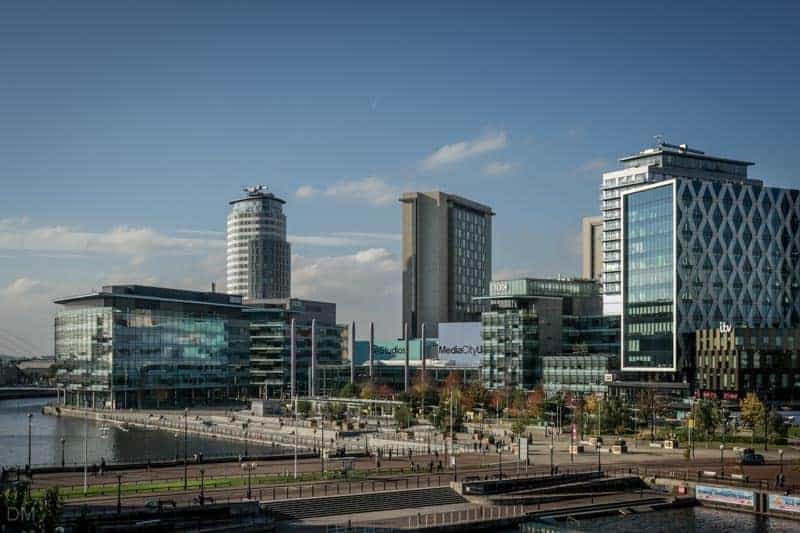 Rebranded as Salford Quays, the area is now home to some of the North West England’s most popular tourist attractions, a creative hub, hotels, a shopping mall, residential apartments, and offices. 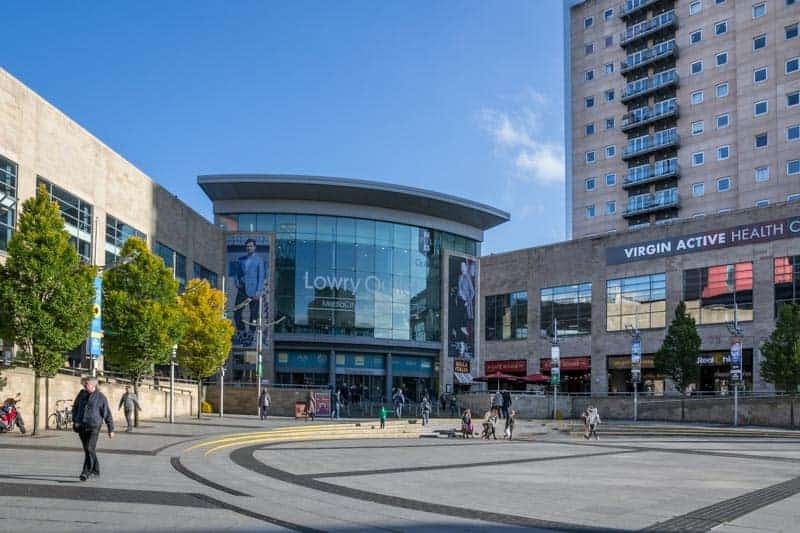 One of the first major developments at Salford Quays was The Lowry, an arts centre boasting theatres, a gallery with large collection of paintings by LS Lowry, and an excellent restaurant. It opened in 2000 and now attracts close to one million visitors every year. 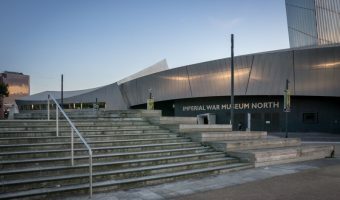 Two years later saw the opening of the Imperial War Museum North, one of the most striking pieces of architecture in North West England. Designed by Daniel Libeskind the building represents a globe shattered by conflict. Innovative exhibits here show how lives have been shaped by war in the 20th and 21st centuries. Admission is free. The Lowry Outlet Mall offers factory outlet shopping at hefty discounts. 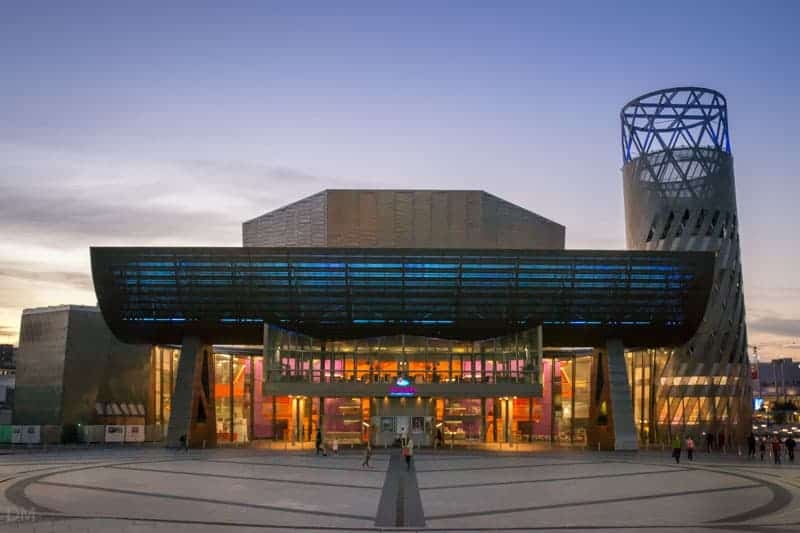 It is also home to the Vue Lowry Manchester (formerly the Red Cinema), a private health club, several restaurants and bars, and a food court. MediaCityUK is a purpose-built home for the creative and digital industries. Tenants include the BBC, ITV and the University of Salford. The development also includes apartments, a Booths supermarket, plus restaurants like Damson, Prezzo and Wagamama. 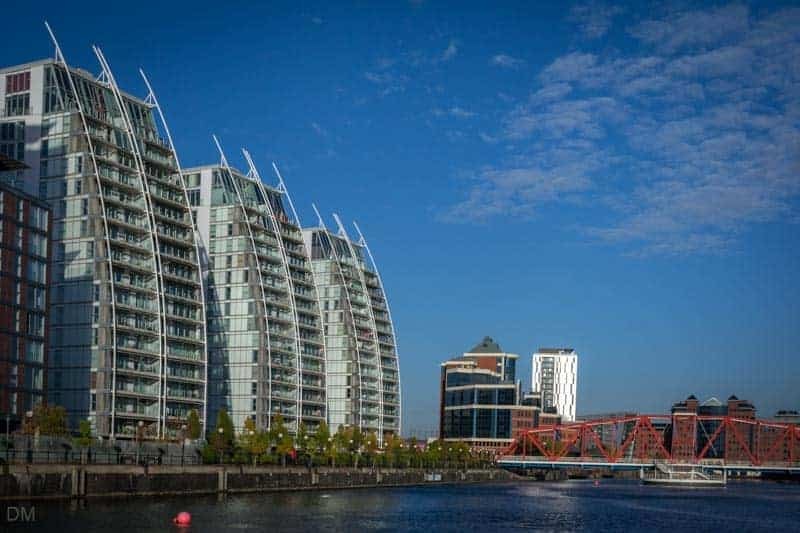 Accommodation options at Salford Quays include the Ramada Manchester Salford Quays, Copthorne Hotel Manchester, Holiday Inn Manchester MediaCityUK, Holiday Inn Express Manchester Salford Quays, and the Travelodge Manchester Salford Quays. To get to Salford Quays by car leave the M60 at Junction 12 and take the M602 and then the A5063. The destination is well-signposted. 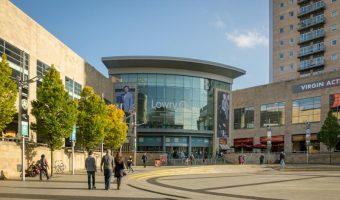 The Lowry Outlet Mall boasts a multi-storey car park. Owners of satellite navigation systems can used the postcode M50 3AH to find it. Parking is free for the first hour. Visitors making a purchase from one of the stores or food outlets can get their ticket validated and enjoy four hours free parking. 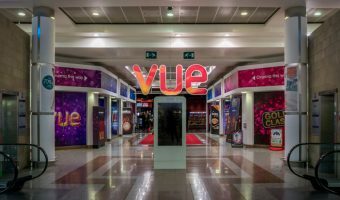 Cinemagoers also benefit from free car parking. Other parking options the car park at the Imperial War Museum North (postcode M17 1TZ) and The Garage multi-storey car park at MediaCityUK (postcode M50 2EQ). Fees apply at both car parks. There are numerous bus services to Salford Quays. The most popular are the 50 and X50 services. 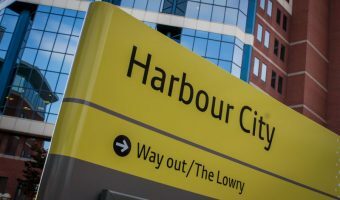 Most visitors to Salford Quays will find the 50 service more convenient. 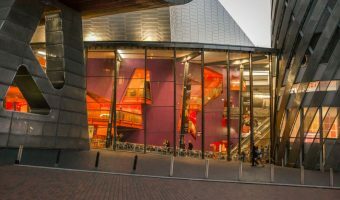 It runs from the Parrs Wood Entertainment Centre in Didsbury to The Lowry. 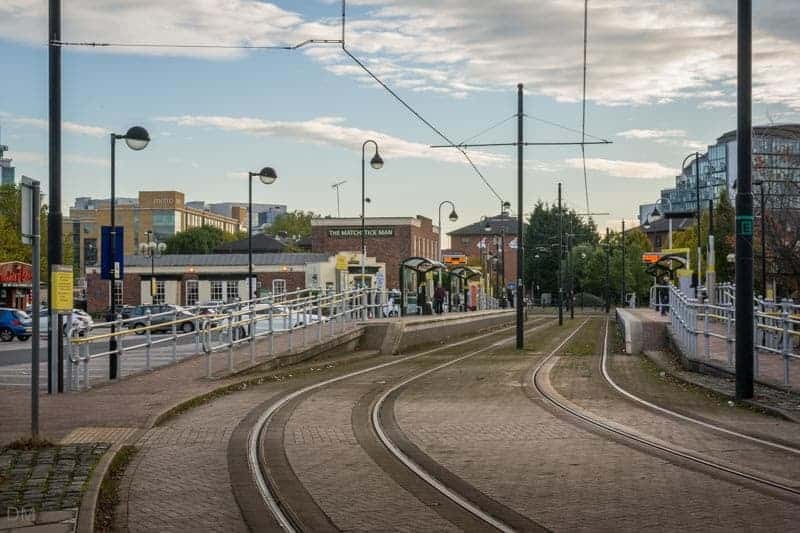 Stops on the way include Albert Square in Manchester City Centre, Salford Central Train Station, and Salford Crescent Train Station. The X50 travels from Piccadilly Gardens Bus Station in Manchester city centre to the Trafford Centre, stopping at the Imperial War Museum North. 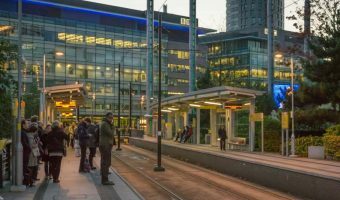 Salford Quays is well served by Manchester’s Metrolink transport system. Stations here are Anchorage, Broadway, Exchange Quay, Harbour City, MediaCityUK, and Salford Quays.